A few days ago Kevin McGuigan, was shot dead. What did Alex Maskey of Sinn Fein say? Aside from a ritual denial of involvement he said: “We must not speculate.” Sinn Fein, with a vast intelligence organization, know nothing and refused to speculate. We should not speculate. If we did, we would almost certainly conclude that the Provisionals killed Kevin McGuigan and that they did so in revenge for the killing of Jock Davidson. Davidson had had McGuigan shot in the arms and legs and, 10 years ago and had ordered the killing of Robert McCartney as an act of revenge following a row in a pub. Anyone following that line of speculation would initially be on their own. The police, despite the fact that they warned McGuigan that his life was in danger from republicans, refused to speculate in the early days of the investigation. Robert McCartney’s sister, Catherine McCartney says that the PSNI cannot properly investigate political cases. Less than a year ago they remained puzzled when a leading UVF figure killed a young woman in the same area. The police are not alone. DUP first minister Peter Robinson says serious consequences would follow from Provisional involvement but refuses to speculate, awaiting a verdict from the police. Essentially the Provisionals have a level of impunity. At the time of Robert McCartney’s murder it was because political negotiations were at a delicate stage. Today it is quite different. The level of impunity is tied to their new role within the peace process, which in large part is one of policing nationalist workers. They police the response to Orange marches. Campaign against the continuation of yearly internment commemorations. Colluded with police to ban a republican march through Belfast. Showcase loyalist and police spokespeople at festivals. The killing of Kevin McGuigan is a dangerous moment. It opens up the possibility of further violence against political opponents of the current settlement. In the same month we had physical confrontation between Sinn Fein members, standing shoulder to shoulder with police and republican protestors denouncing the platform given to the Chief Constable. The further introduction of austerity in the North will create new tensions between Sinn Fein and nationalist workers in the ghettoes. It is significant that an armed cover organization, Action Against Drugs, has been set up in the expectation that senior figures will face physical threat. It also indicates how ludicrous Sinn Fein claims of leftism are. They are fully integrated into a reactionary sectarian settlement controlled by British imperialism. Even if they had any doubts, for example about signing up to further austerity, the British, with full information about the McGuigan killing, have them by the throat and could quickly find them guilty of the murder and expel them from the administration. A sign that the pressure is being stepped up came with a PSNI statement saying that the Provos were involved and using the AAD organization as a cover. In part this is because the facts behind the killing were so self-evident that even the PSNI were finding them hard to ignore. The killers were so arrogant and stupid that they were simultaneously denying involvement and giving interviews to local journalists justifying the killing. Above all however the British are cracking the whip. 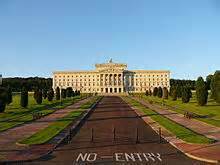 They have already said that Stormont will close if Sinn Fein does not sign up to austerity. Now they have the means to expel the party with full political responsibility falling, not on gallant defenders of the workers, but on dishonest and remorseless killers. The PSNI are holding out a lifeline. They refuse to speculate as to whether the armed group is part of a chain of command that would lead back to the Provisional leadership. The DUP, while muttering about Sinn Fein’s expulsion, are awaiting the decision of the PSNI. As with other corrupt movements there is no way back. The only road for survival is capitulation – frantic declarations of support for the state forces linked to political capitulation on austerity. Choreography (n) A series of dance steps. (Irish peace process) A secret agreement, implemented by a fixed series of statements and actions. The word choreography was widely used to describe to describe the retreats and betrayals by Sinn Fein as they accommodated to renewed partition. It has faded from use as the North arrived at the current unstable political equilibrium. Now we have a new betrayal, a new choreography. The anti-internment league announce their annual march through Belfast. The former organiser has been charged following a republican Easter speech and is banned from any political activity. Sinn Fein move their annual Ballymurphy massacre march so that the timing conflicts with the AIL march. The Parades Commission put timing restrictions on the AIL that are impossible to meet, while allowing three counter-demonstrations organised by Loyalist paramilitaries to take control of the city centre. Police stop the AIL march as it leaves Ardoyne. After speeches the march disperses peacefully. The BBC announce the police action and note that over 50 officers were injured on a previous demonstration – only locals realize that it was the loyalists, celebrating their triumph in the city centre, who had attacked the police. Police deploy water cannon, invade the area, make arrests, in response to a limited amount of violence sparked off by their presence. Sinn Fein leader Martin McGuinness immediately condemns the violence, which he lays at the door of the AIL march organisers. His remarks are echoed other Sinn Fein grandees, by the Catholic church, the British Secretary of SCatholic Churshtate and the unionists and loyalists. The outcome of the choreography is that Sinn Fein support for the sectarian state in the North is extended. Where before they condemned physical force by republicans, now they denounce political action. Belfast city centre is effectively closed to republican demonstrations – a keynote feature of the previous sectarian state.